This is Dee's recipe that she uses (sparingly, but does use it) during the Holiday Season. Chill a large mixing bowl in the freezer for 10 minutes. 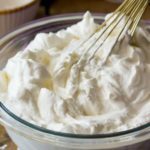 Remove the bowl from the freezer and pour the whipping cream into it. Beat with an electric mixer until the cream begins to thicken. Add the maple syrup slowly, ensuring that it gets mixed in. Continue beating until stiff peaks form. Use immediately. The remainder can be saved in an airtight container for 3-4 days.